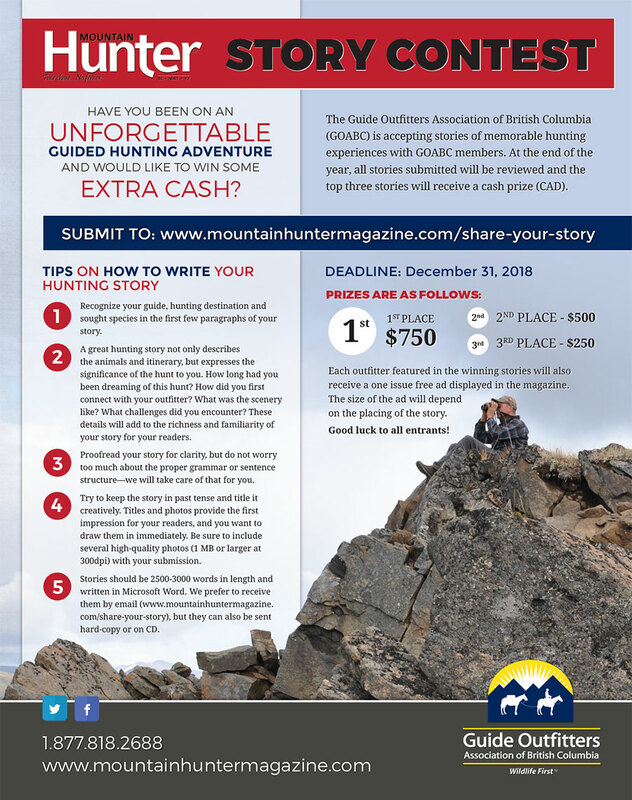 Each year the Guide Outfitters Association of BC (GOABC) holds a contest for best BC Guided hunting stories that have been submitted for publication in the Mountain Hunter™ magazine. 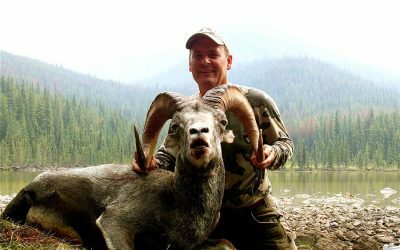 These stories are written by the hunters and feature memorable hunting experiences with GOABC members. At the end of the year all stories submitted will be reviewed and the top three stories will receive a cash prize (CAD) from $250 to $750. 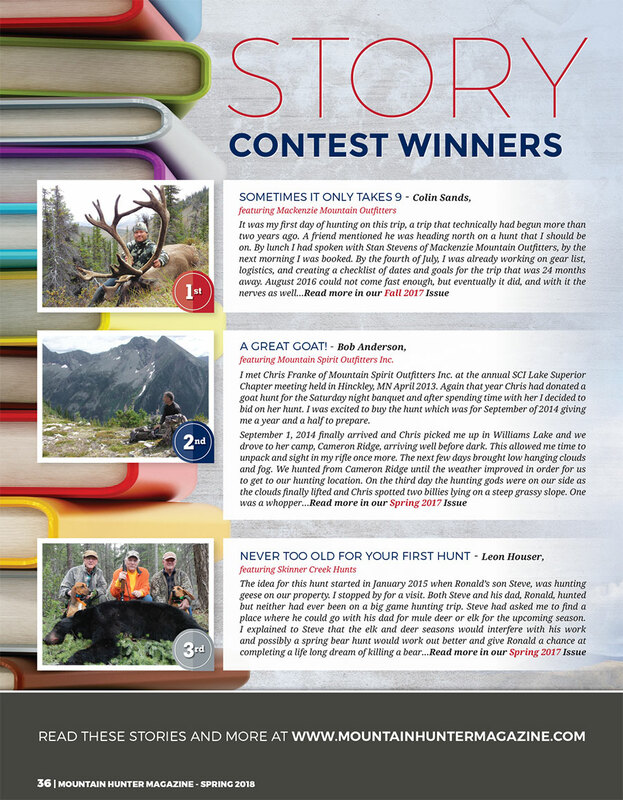 Each Outfitter featured in the winning stories will also receive a one issue free ad displayed in the magazine. Recognize your guide, hunting destination and sought species in the first few paragraphs of your story. A great hunting story not only describes the animals and itinerary, but expresses the significance of the hunt to you. How long had you been dreaming of this hunt? How did you first connect with your outfitter? What was the scenery like? What challenges did you encounter? These details will add to richness and familiarity of your story for your readers. Proofread your story for clarity, but do not worry too much about the proper grammar or sentence structure—we will take care of that for you. Try to keep the story in past tense and title it creatively. Titles and photos provide the first impression for your readers, and you want to draw them in immediately. Be sure to include several high-quality photos (1 MB or larger at 300dpi) with your submission. Stories should be 2500-3000 words in length and written in Microsoft Word. We prefer to receive them by email (click here to use our online form), but they can also be sent hard-copy or on CD. 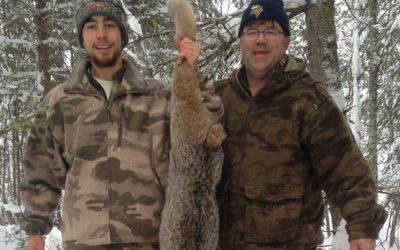 After two years of researching an outfitter for Stone sheep, I was able to decide on a hunt with Mike and Dixie Hammett of Sikanni River Outfitting. The hunt took place in August, so I had time to wonder and dream about the great mountains of British Columbia. There is no bond as strong as that between a father and son. Though I have fulfilled only one of these two roles, after twenty-two years of life, I firmly believe this cliché to be true. I look up to my dad as a mentor, a role model, and simply a friend, and our relationship would not be what it is today if it weren’t for the experiences we’ve shared in the great outdoors. Are you Going to Shoot it, or What? 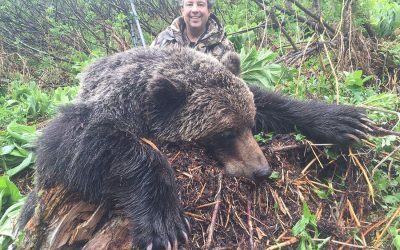 I hunted with Stuart Maitland from Eureka Peak Lodge and Outfitters around ten years ago. It was a trapline adventure and the trip had been a resounding success, with daily snow machine rides, and many critters trapped. I heard that Stu’s area had been producing some excellent interior grizzlies, so I stopped by his booth at the 2016 Safari Club International convention, to discuss his grizzly hunts. You can browse our past issues online Click here for more.